Hello from Heathrow, where I have just flown in from Prague. Naturally I was delighted to learn that British Airways have made big improvements to Club Toastie Europe on my flight today. Previously, I would receive a hot meal on such a band 3 lunchtime flight. For example, it may have been cod with mash and minted peas, a fillet of salmon with tagliatelle, or perhaps a piece of pork belly. These meals were often vastly too filling, resulting in wastage and the associated damaging environmental concerns. So, how was the new-improved flight? The first noticeable improvement was that I was offered my meal choice before any drink. It is great to see that BA have removed this cumbersome drinks run. As all good restaurant-owners knows, diners should always be served their meal before any water or wine. The second improvement I discovered was in the new improved meal choice. I was offered a choice of a salad, or a cheese and tomato panini; BA are assisting with my weight-loss programme. Excellent! Thankfully the panini was sufficiently unappealing that it forces me to take the healthy salad option - top marks here. The third improvement was the reduced portion-size, thus furthering my weight-loss programme. 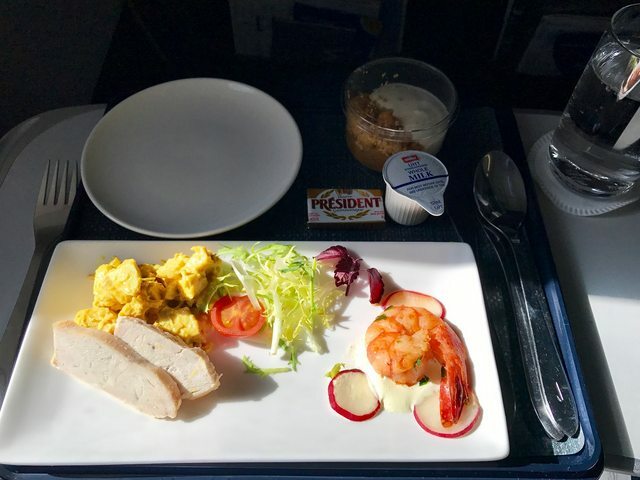 After years of complaints about the three-prawn salad on short-haul, I was delighted to learn that BA have finally listened to this feedback and improved this. The solitary prawn in my one-prawn salad was firmer and tastier, albeit a tad overcooked. It was well complemented by the sweet and succulent half-slice of a baby cherry tomato, which was plump and with improved flavour. The sprig of a salad leaf added a beautiful bouquet of colour, and the empty side plate improved the Feng Shui of the amuse-bouche meal. The fourth improvement was the removal of miniature wine bottles; assisting with my New Year's resolution to reduce my alcohol consumption. As I discovered to my delight, serving wine by hand into thimble-sized glasses limits the amount I can consume, as it requires frequent top-ups from an otherwise busy crew. Furthermore, the round-catering and inability to chill wine makes me even more likely to avoid the Champagne or white. Splendid! All in all, a big improvement.